This is still a Skylanders Giants Household. For Liam’s birthday, I think he received about 12 new figurines for the game! I was shocked!! We’ve been playing ever since. I’m trying to get on top of ‘back to school’ before the crowds head to the stores. Check out Liam’s 3D backpack! 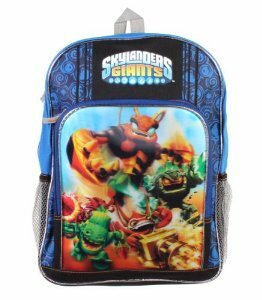 It’s the Skylander Giants Golden Zooky Bees school bag.